Yay, today is the Day Of Casting. I started at 11am, and finished up around 5pm. I was busy for about 6 hours straight, stopping only to grab a sandwich and a cup of tea. I built a wooden flask some time ago, but it was still lacking some means of aligning the top and bottom halves. The quickest way was to go to Homebase and pick up a couple of sliding door clasps - the kind which get used on toilet doors. I could’ve probably made up something myself, but this was a lot quicker and daylight hours are limited in November in Scotland! I started with the wooden pulley pattern face-down on some wood, and rammed in moulding sand around it. 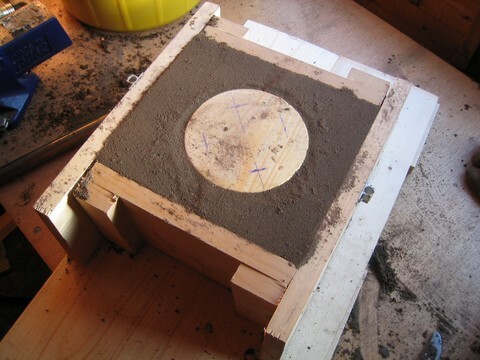 The moulding sand is a mixture of sand, fire clay and some water. It’s hard to judge how much water to use, so I’m just going to give it a try and see how it turns out. This photo was taken after I’d rubbed in the bottom board and flipped the mould over. A few lumps of sand had got caught under the pattern (duh, should’ve checked that first) and so I’ve cleaned up the sand around the pattern using my finger.